Problems at Northside Food Market Stuck in "Due Process Limbo"
Post by the Hawthorne Hawkman, contributed photos originally appeared in a Johnny Northside post. Almost a year ago to the day, I published a post on Johnny Northside about the problematic Northside "Food" Market. (Food is in quotations here because as delicious as Flamin' Hot Cheetos are, they don't qualify as actual sustenance.) McKinley neighbors were dealing with cars that were constantly illegally parked, even more constant drug dealing, loitering, and an unlicensed rental unit. Well, after a year of clamoring, neighbors can proudly say that cars aren't parked illegally there. 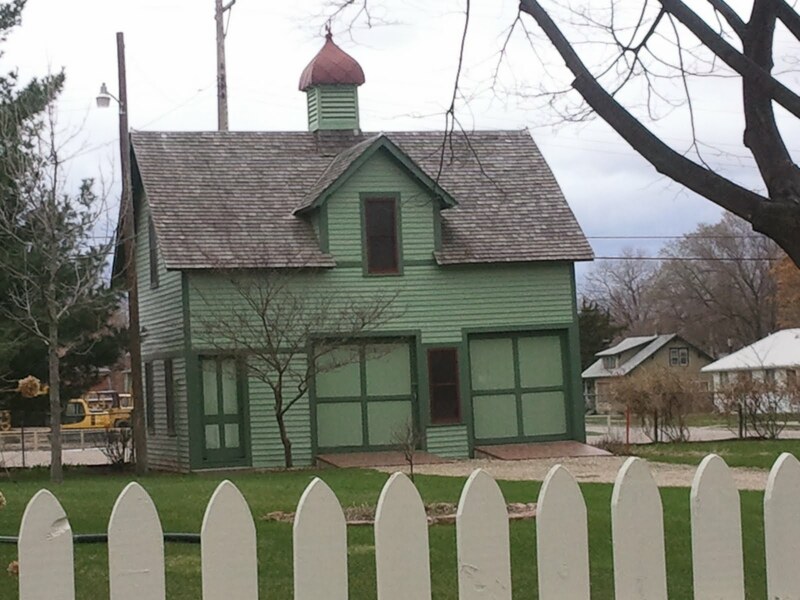 Oh, and the place appears to have a rental license for their 450-square foot postage stamp of a room upstairs. 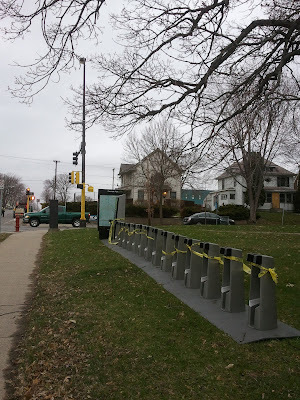 The rampant drug dealing, loitering, and littering is still a fact of life at 36th and Lyndale though, and there's this annoying piece of sign spam that is high up and BOLTED on. It's thwarted every effort of mine to get it down, and remained so long that the black Sharpie writing has actually faded away. 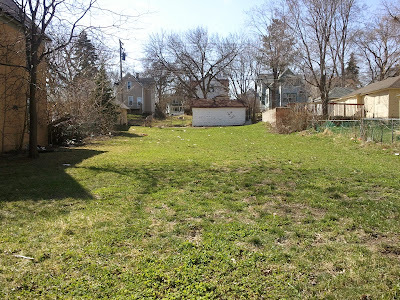 Still, I live twelve blocks from the place and I've made more effort to remove that blight than the business or property owners have. 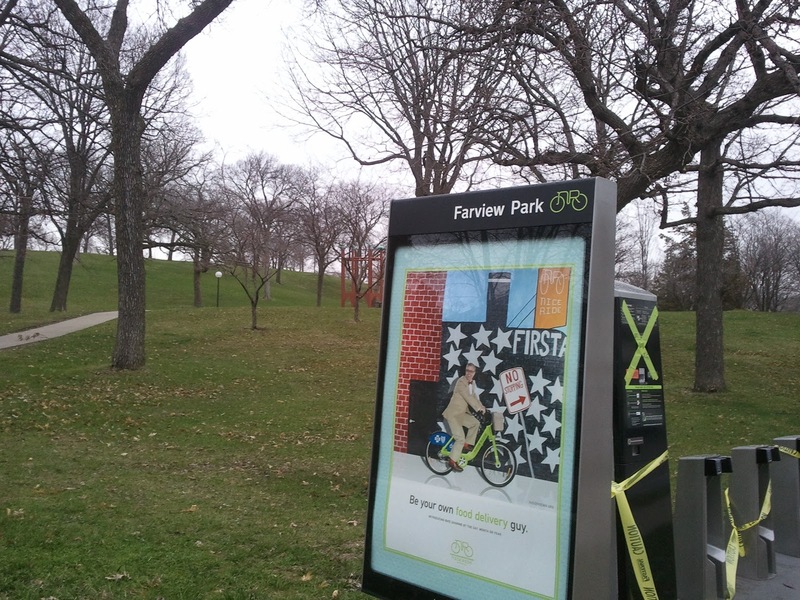 Nice Ride Kiosk at Farview Park! 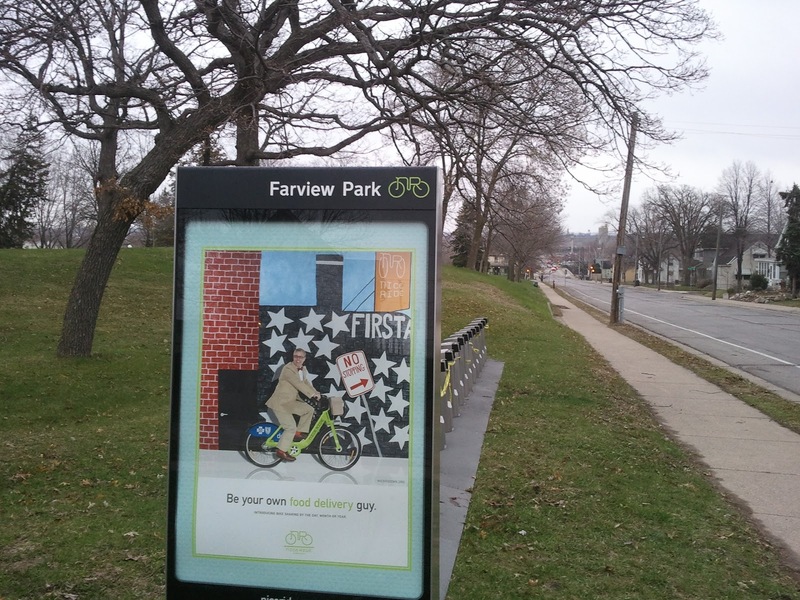 There are now actual bikes and a usable kiosk at Farview Park on the corner of 26th Ave N and Lyndale Ave N. At the time the picture was taken, the kiosk wasn't up and running yet. 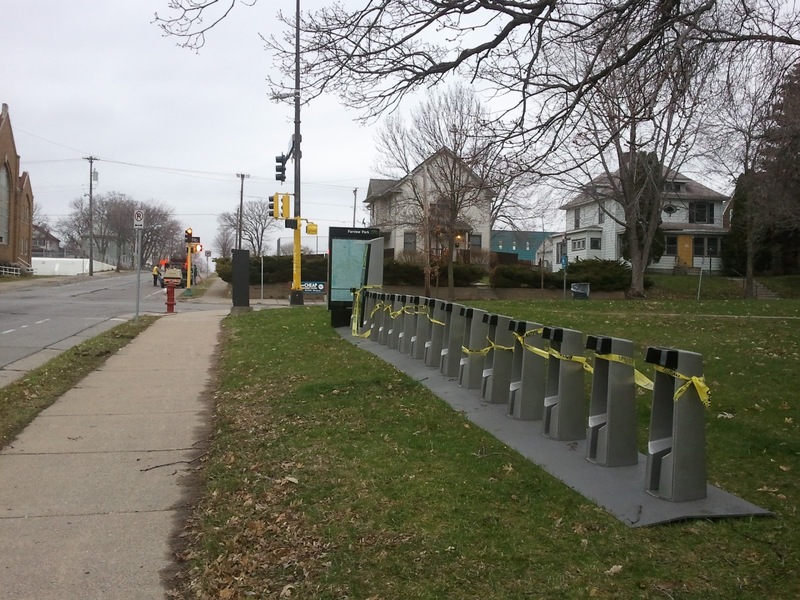 I'm thrilled that we've got a Nice Ride station at the park and on one of the main bicycle thoroughfares in NoMi. But not everyone is so overjoyed, and I can see why. 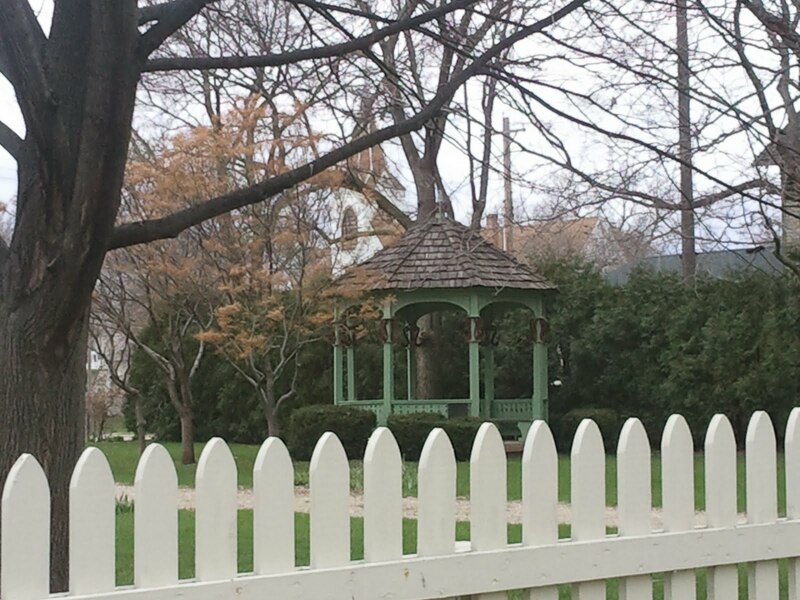 I've received some communication about concerns over letting private entities come on to our park land. 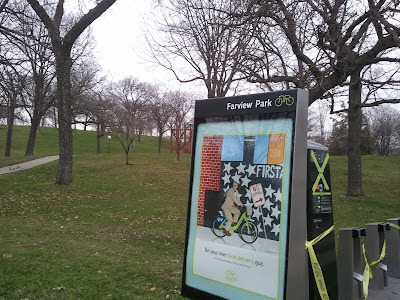 While doing so could create confusion over who is responsible for what, the contract approved by the Park Board does seem to clearly indicate that Nice Ride is responsible for cleaning and maintaining the kiosk on a daily basis. As long as the kiosk is well-maintained and hopefully regularly used, I'll be happy to have Nice Ride a block or so away from my place. 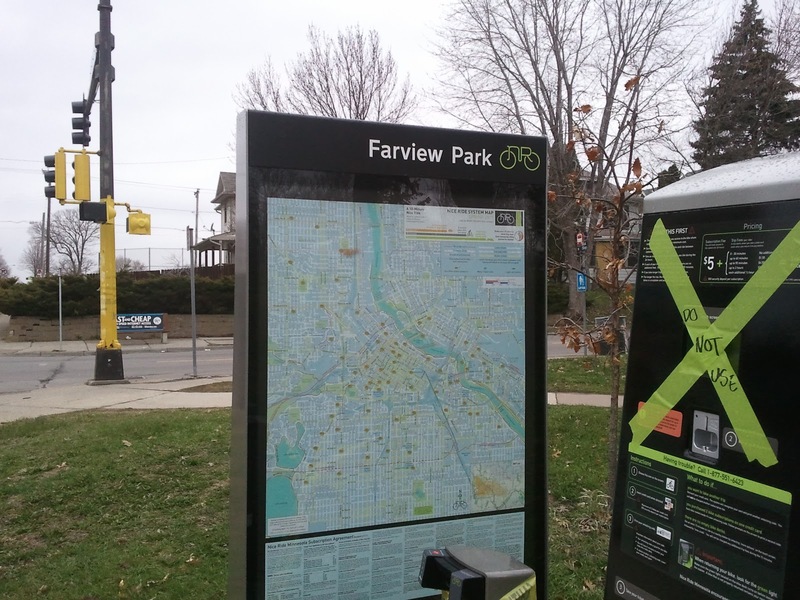 Oh, and in reading that contract, I found out that the Nice Ride Kiosks are solar powered. How cool is that?! Last week I noticed a few pieces of sign spam along Fremont and Emerson in the Hawthorne and Jordan neighborhoods. (Or was the Emerson one on the odd side and both were in Jordan?) I never got around to taking them down, and then on my first day back from vacation, I found these sitting on my desk as if they were a trophy. I'm told it was Johnny Northside who did me the favor of taking these down. I blocked the number from the photo, but did a bit of research. It seems to belong to SF Homes LLC of Corcoran, Minnesota. I haven't yet found much on them, although they appear to own properties in Minneapolis, St. Paul, Big Lake, and Duluth. Tomorrow they'll get a call from the Hawkman. Thanks, John! 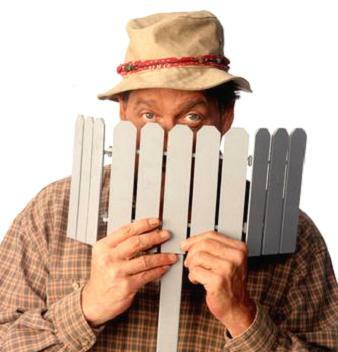 Post by the Hawthorne Hawkman, image is Wilson from "Home Improvement," the neighbor who never showed his face. Here's why I'm skeptical of this new James Neighbor blog and profile. In its inaugural post, he immediately references "James K," most likely JACC board member James Kpoto. Last summer and fall when the NoMi blog wars were at a fever pitch, someone had been going around leaving comments pretending to be James Kpoto. So right off the bat I'm leery. 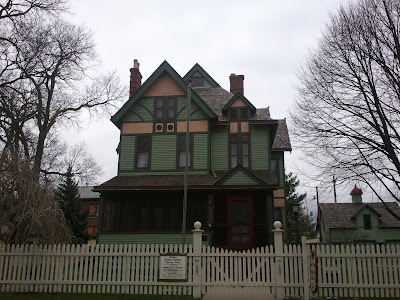 And out of all the almost limitless blog posts or controversies to choose from in NoMi, what becomes the touchstone for James Neighbor? The infamous "White Baby" video by Don Allen (that Don took down but not before Johnny Northside preserved it). Now it may be just my opinion, but I sincerely doubt that the White Baby video mattered much at all to anyone other than John, Don, and a handful of the staunchest bloggers on each side of the NoMi blog wars. And I find it even more unlikely that some NoMi newbie would see that as emblematic of...well, anything. Then, after my comment last night, which was posted at 10:51 p.m. on April 25, James Neighbor did a post at 9:41 p.m. that same night, lamenting being a suspected troll. 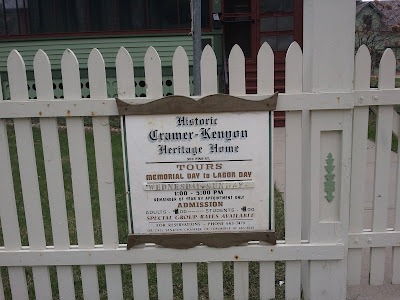 On Blogger, one can rather easily manipulate the time stamping on a post. To the best of my knowledge though, the time at which a comment is posted cannot be altered. I most certainly did not alter when my comment appeared, and 10:51 is the accurate time for that. NoMi Passenger pretty much called James Neighbor out for a stroll to meet him/her/them in person. I won't quite go that far. Perhaps he/she/they wish to remain anonymous for a while, and I can certainly respect that. James Neighbor, if you're legit then keep on doing what you want in the way you want to and things will all even out. And just remember NoMi bloggers have been burned before, and have had to deal with a variety of impersonators. Commenters have assumed identities that aren't theirs, created fake personas, and even gone under screen names full of sexual innuendo a la a Bart Simpson prank call. And this is why, right or wrong, I trust the Area Hawkman and Area Neighbor sites more than James Neighbor. I have no clue who either are, but I do know that AH/AN have a clear goal in mind: mock the anti-bloggers when necessary. They believe in it and stick to it. JN, do the same, and you'll get credibility here. And if you're not legit, you'll have to be a hell of a lot more sneaky to fool anyone here. 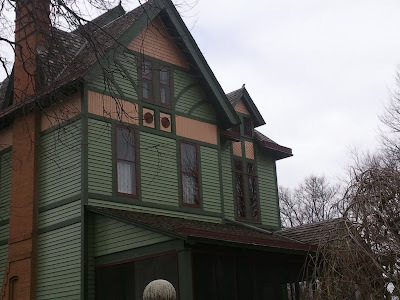 Finally, I'll continue to publish James Neighbor comments on this blog for the time being. In spite of my suspicions, I'd rather err on the side of an open dialogue. While vacationing with my family in Yankton, South Dakota this Easter, I was left with a few hours to kill on a lazy Saturday afternoon. 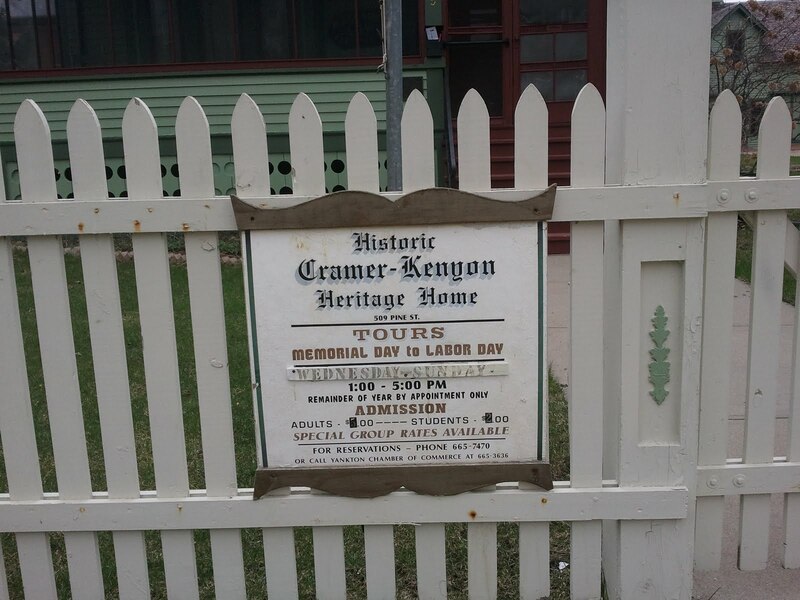 My sister-in-law and newborn nephew would be my tour guides, but let's be honest here, Yankton is not a bustling metropolis with a host of activities at the ready. So although many people would struggle to find things to do, I knew immediately what I wanted. I turned to her and decisively said, "Take me to the crappy part of town with nice houses." 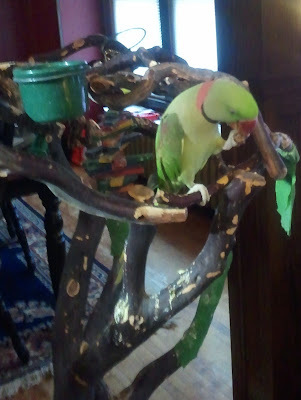 Post and photo by the Hawthorne Hawkman. Earlier this month at the Hawthorne Huddle, we had three excellent speakers. 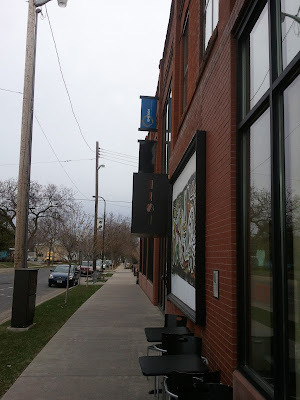 The first presentation was on recycling, the second was a Hennepin County employee discussing their lead abatement programs, and the third was a representative trying to increase more biking and walking in NoMi. I've been vocal in my own ways on all three issues, but for now we'll focus on windows. That county employee talked about window replacement and also window refurbishment as ways to abate lead paint from properties. He handed out a spiffy GIS dot map of all the lead abatement that they've done, and it should come as no surprise that much of the work was concentrated in north Minneapolis. Before we get to some of my pointed questions, it's time for a disclaimer. DISCLAIMER: I am generally against window replacement and in favor of window repair/refurbishment. However, on the controversial issue of whether children should suffer lead-based brain damage, I come down pretty squarely on the pro-children/anti-lead poisoning brain damage side of things. 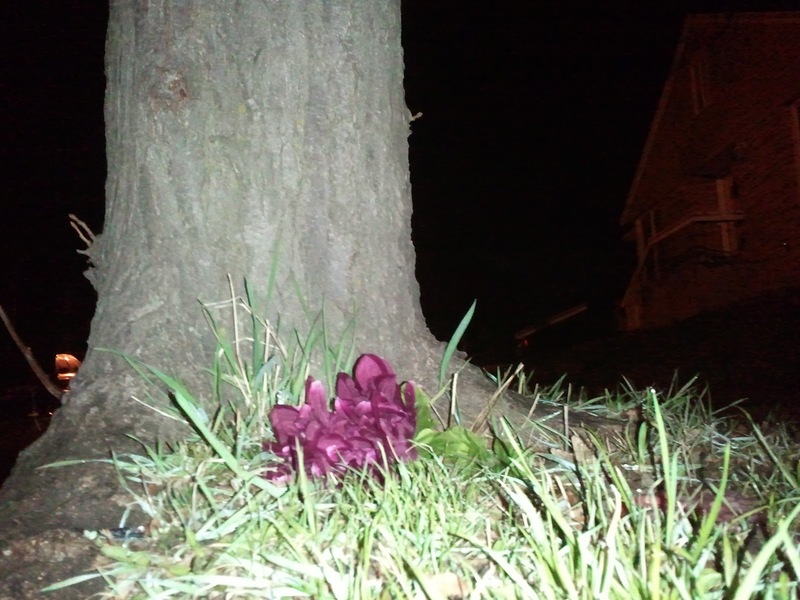 Photo of Christopher DeRonde Memorial at 30th and Colfax by the Hawthorne Hawkman. Content of post is a press release written by Casanova Criminal Defense. 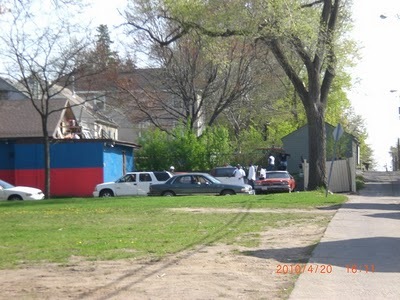 April 20, 2011 – Minneapolis, MN. Closing arguments are set to begin Thursday in the homicide trial of Christopher Hayes. Hayes has been charged with first degree murder in the September 17, 2010 shooting death of Christopher DeRonde. This case has been widely reported in the media because of the Minneapolis Police Department touting the use of their ShotSpotter technology in what they say is their first homicide apprehension as a result of using this system. The defense for Hayes claims that in an effort to justify the expense of the ShotSpotter system, the City is pushing forward in a case rife with police department errors. The case is also unusual in that it pits family members against each other as the state’s star witness testified that it was his nephew (Hayes) who shot DeRonde. Hayes is being represented in this case by a team of defense lawyers – Jennifer Casanova from Casanova Criminal Defense and Elise Chambers from the Minnesota Law Collective. 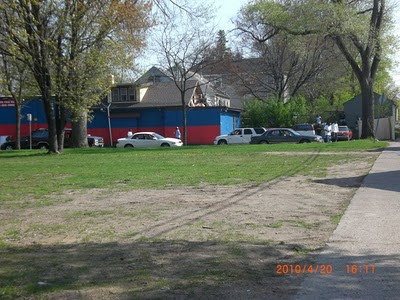 On the morning of September 17, 2010, Christopher DeRonde was shot near the intersection of 30th Avenue North and Colfax Avenue in Minneapolis. At the sound of the gunshot, the ShotSpotter system kicked into action, where a network of microphones and video cameras are used to train some of the city’s 150+ public safety video cameras on the location where the shots were detected. Police spokesmen have previously claimed that witness information would not have led to an arrest if not for the vehicle driving towards a public safety camera. Minneapolis spokesman Bill Palmer claimed “We never would have gotten to the point where the witness would have been helpful without that technology.” Michael James Funches and Christopher Hayes are both said to have been in the car on the video, but reports differ on who was driving. Last year, Twin Cities Habitat for Humanity purchased quite a few homes in Hawthorne to rehab or in some cases demolish and build new. Folks may have heard a little bit about that in the press, what with President Carter and Vice President Mondale working together in the Hawthorne EcoVillage. It was kind of a big deal. The story of 315 30th Ave N is a big deal too, but on a more personal level within Hawthorne. Habitat bought this property with the intention of rehabbing the home, but through an odd sequence of events, both the vinyl siding and the paint underneath tested positive for lead. 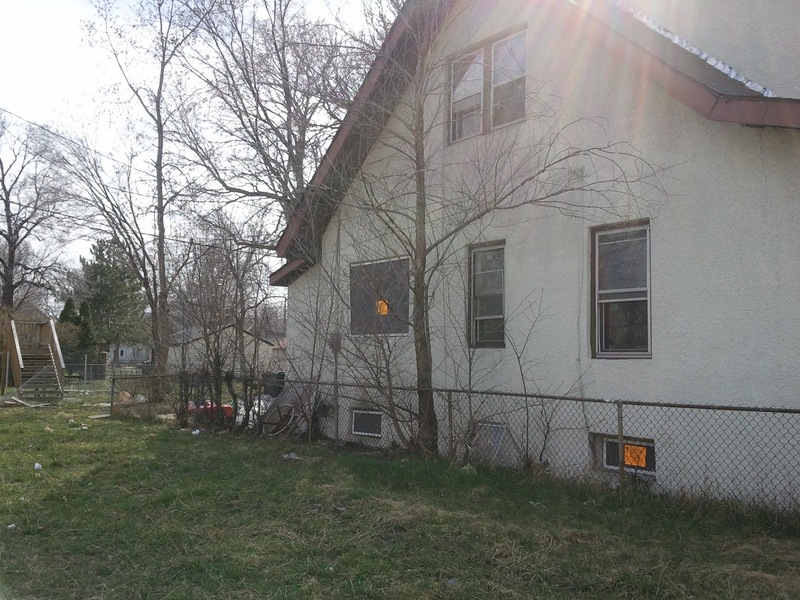 The abatement costs for lead removal just about doubled. That, combined with some foundation issues, led Habitat to the conclusion that they could build a longer-standing and less expensive house by demolishing and starting anew. Recently in the Strib, there were two articles that had tiny bits of information about slumlords in north Minneapolis. Where the NoMi blogosphere comes in is that we can take those shreds of info and hold them up to a magnifying glass for all to see. 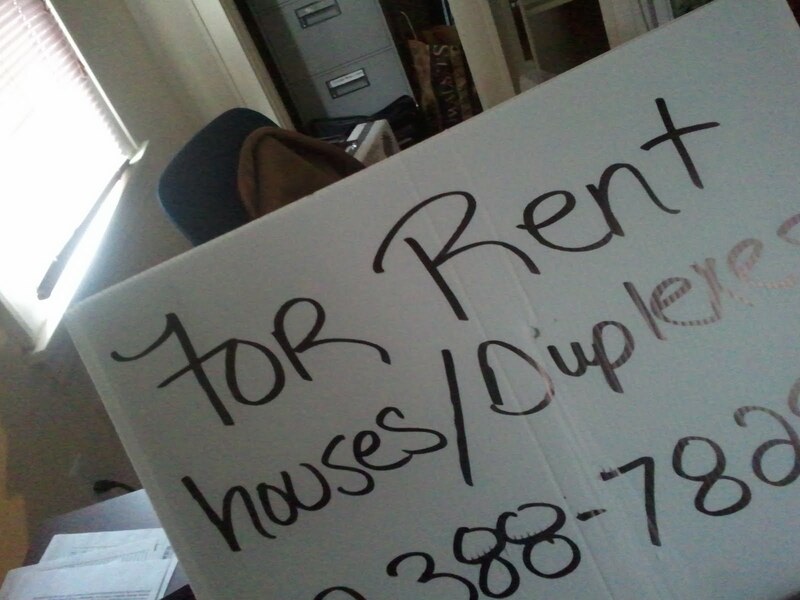 In one article, a list of landlords who had lost one or more rental licenses was published. Near the bottom of the article were two names of landlords familiar to NoMi: Mahmood Khan and the Durkops (Aaron and Mary). Khan shouldn't need much introduction, and the Durkops were the principals behind Kaizen Property Solutions LLC, who were the designated manager of Paul Koenig's dollar houses. Khan and the Durkops each lost one rental license, but from which properties? 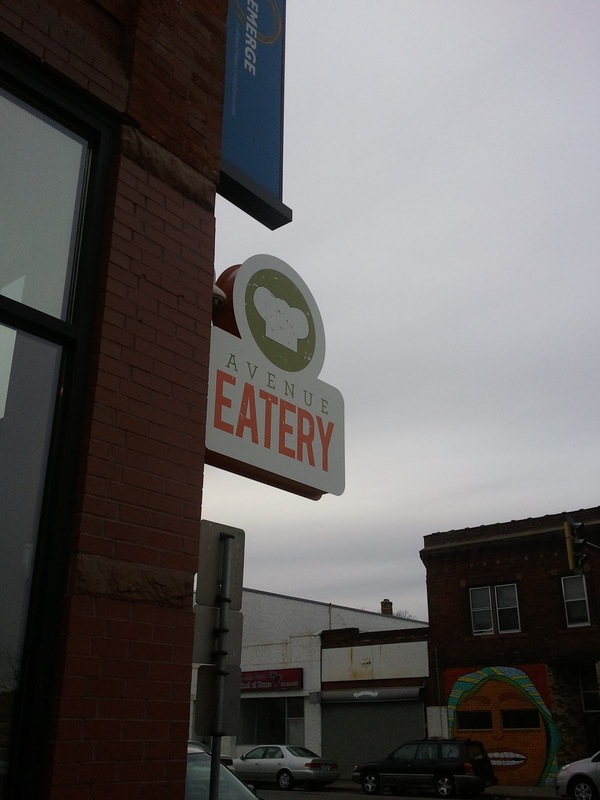 Although the Avenue Eatery has been operating for a little while now, Wednesday marked the official grand opening. I stopped by to see what they had to offer, but first went to The Lowry Cafe by mistake. Somehow I got it in my head that The Lowry Cafe was opening instead. But this is a good problem to have; two new sit-down cafes that serve healthy food are opening in NoMi within short periods of each other. Like many grand openings along Broadway, the Avenue Eatery event was attended by a veritable who's who of NoMi. 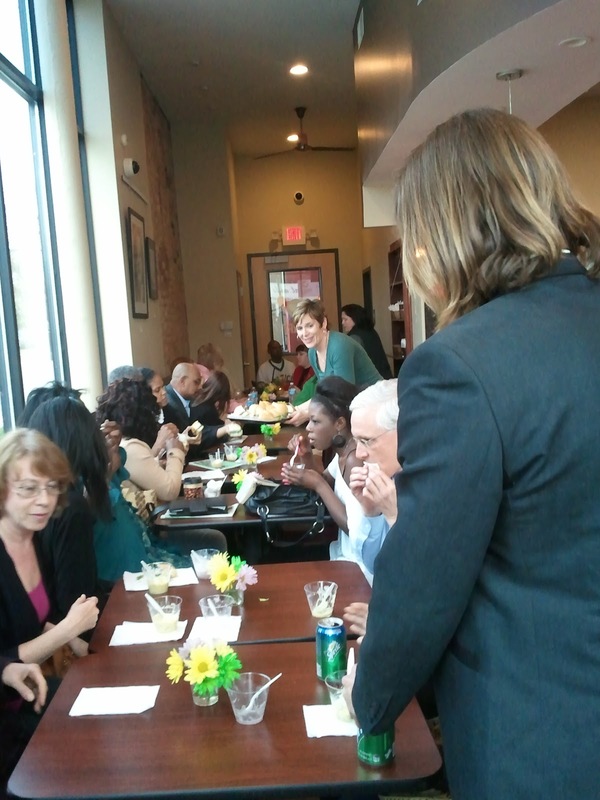 Neighborhood board members, residents, and people who work over north crowded into (and sometimes out of) the coffee shop to welcome a new business into the community. NoMi photographer Pat Carney was on hand to document the event, and surely he got better photos than I'll post here. A link to his photo album will be added when that's online. Donate to Support Community Investigative Journalism! 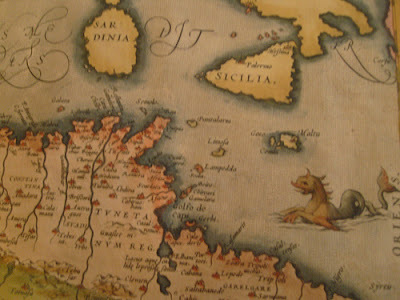 Post by the Hawthorne Hawkman, image from the spot.us website for this story. 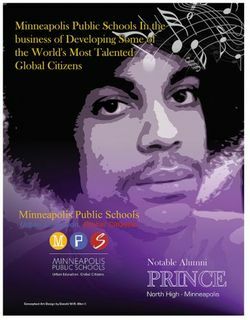 Prince, by the way, did NOT graduate from North High. A correction in progress: links provided by Don Allen indicate Prince may have attended North High for as long as one year, although Prince graduated elsewhere. 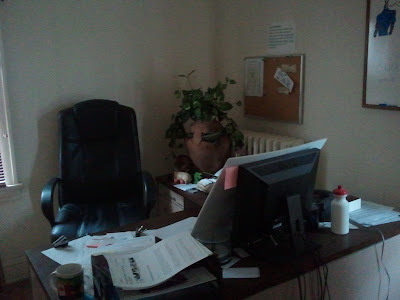 This post has been amended to reflect that, with further verification requested. The Johnny Northside blog broke the story about Don Allen and his $15,000 contract with the Minneapolis Public Schools more than two weeks before the Star Tribune wrote about the topic. One of the intrepid reporters for the Twin Cities Daily Planet, Sheila Regan, has taken it upon herself to dig even deeper into the murky world of no-bid contracts at the MPS. Sheila has been threatened by Don Allen in relation to her investigation and reporting on him and his contract. Through the spot.us site, Regan is requesting funding that will support this story. Readers can fund through direct contributions or by simply creating an account and taking a survey. Five minutes of your time can help support local investigative journalism and hold our public school system accountable. 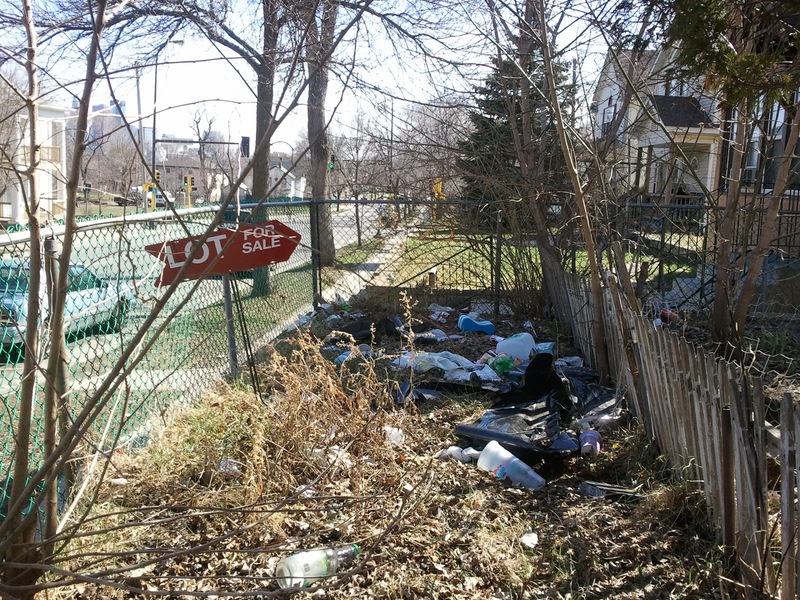 Litter at a Vacant Lot--It's 311 Time! The vacant lot at 2415 Lyndale Ave N was literally (ha!) covered with so much garbage that several Hawthorne residents had been complaining about how bad it made the block look. So I thought I might go over and either call 311 or just pick it up myself. In the pile of trash pictured, there were both men's and women's underwear, meaning the job of cleaning that up would fall on either the property owner or someone who gets paid to do such things. And speaking of the responsible party, the proud owner of this lot is Ibrahim Khan of Columbia Heights. The lot, by the way, appears to be for sale. Any takers should let Khan know at 4319 McCleod St NE, Columbia Heights MN 55421. It's unlikely that this level of debris just randomly accumulated at the site. 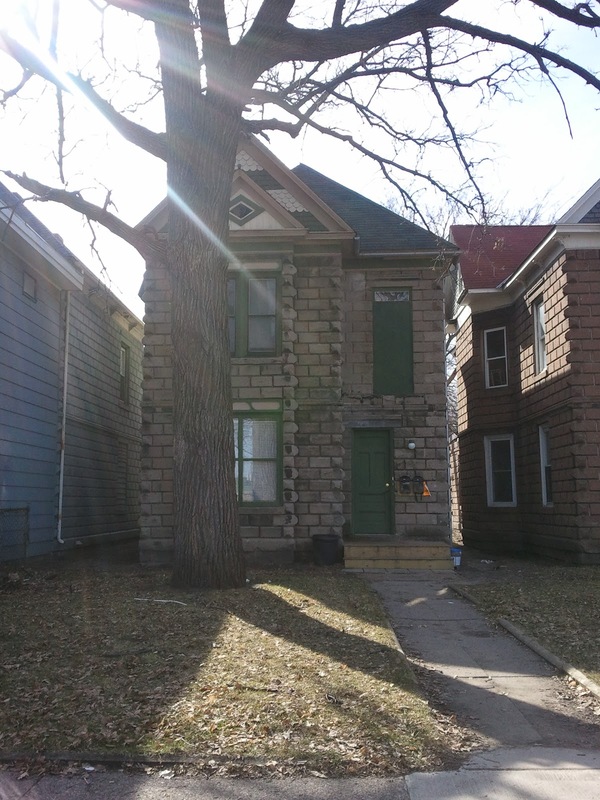 The house to the north of this one, 2417 Lyndale, is vacant. 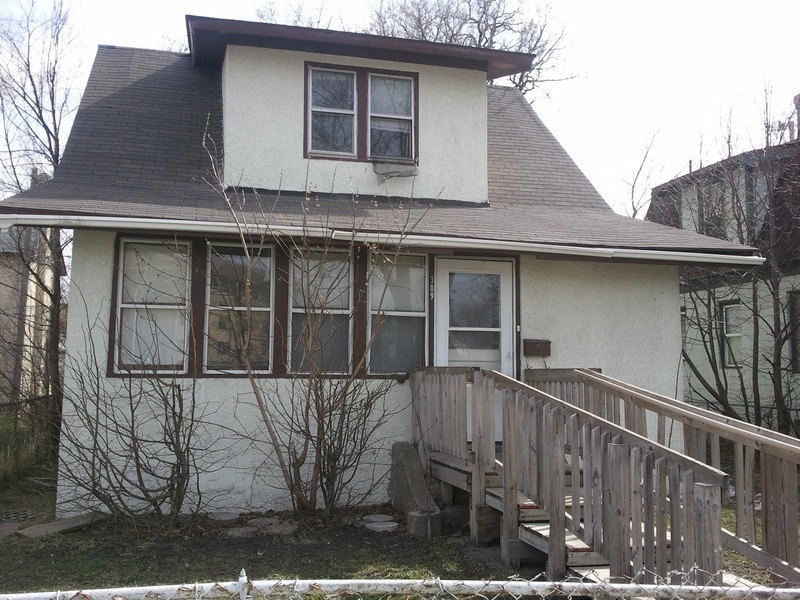 But to the south, 2411 Lyndale Ave N has renters. 2411 still shows on city and county records as being owned by various mortgage companies, but has probably been picked up by a slumlord recently. Where has the Hawkman been lately? Taking advantage of the great weather and getting out on our bike trails. 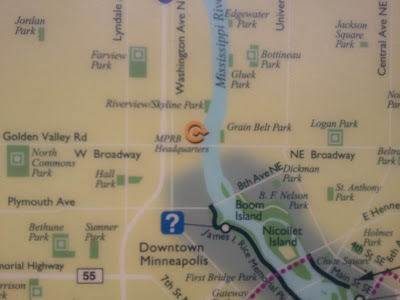 My normal route starts at my place, then goes down to the river and to Minnehaha, across Minneapolis, back north around the lakes and Theo Wirth Parkway, then along 26th Avenue back home. It's a 25-mile round trip and I can usually finish it in about two hours. While on this trip, I stopped at a kiosk and noticed something oddly frustrating about the bike map. We'll have to look a bit closer. 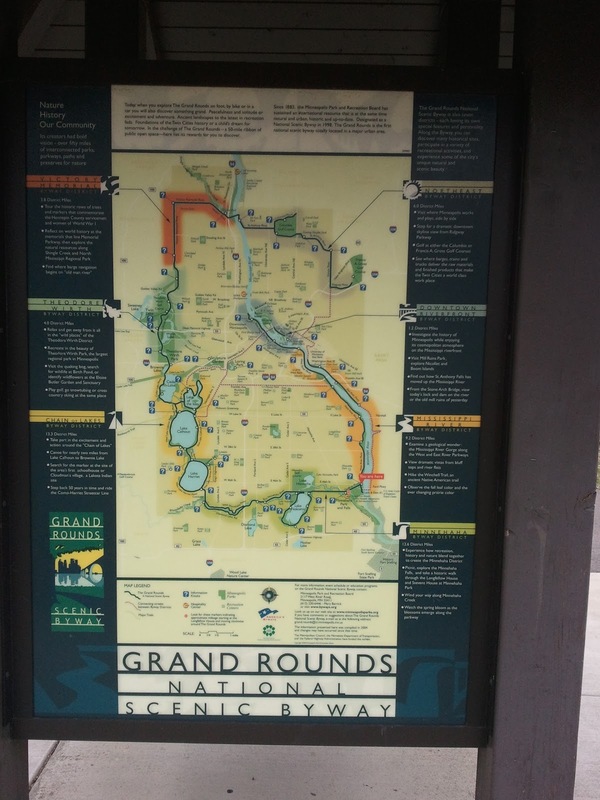 Even though the Park Board headquarters are in north Minneapolis, the designated Grand Rounds trail stops at Plymouth Avenue. Plymouth, by the way, is the southern border of north Minneapolis neighborhoods at that particular junction. Why didn't the Park Board mark the Grand Rounds all the way to the end of the bike path along the river? What we're left with from this map is the false notion that the bike trail stops before you enter NoMi. It's like the old maps of uncharted waters, that tell travelers "Here there be monsters." The Minneapolis Park Board would like to welcome you to NoMi. Image from the Rebel Zen blog. 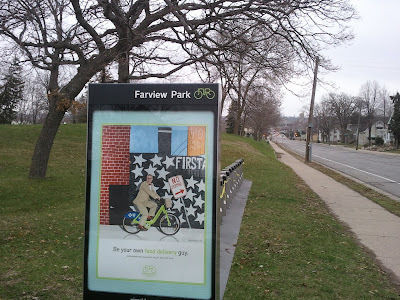 Putting some of the blame back on north Minneapolis neighborhoods' shoulders though, much of the bike paths along the river and lakes have signs telling you which neighborhood or community you're in. We haven't done that for ourselves. 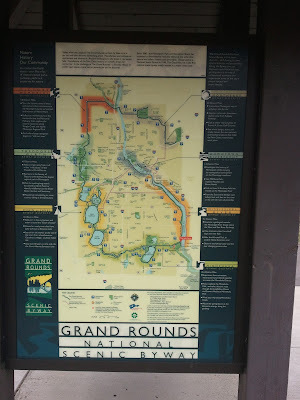 If we expect the Park Board to acknowledge our existence on the Grand Rounds trail map, we need to put up our own signage. Who's Behind the Sign Spam? Post and photo by the Hawthorne Hawkman, image after the jump from the Total Freedom Realty website. A while ago, the I.I. 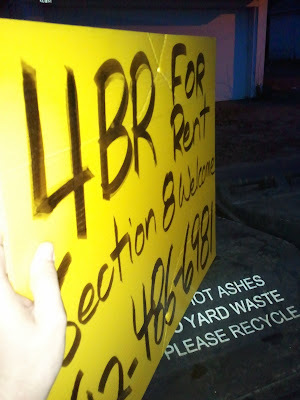 and I went around NoMi removing as much sign spam as we could find - 26 signs in all. Either we missed one by the Holiday gas station, or the spammers don't know when to quit. Either way, the sign was down after my bike ride today. But I decided to see what I could find out about who's putting up the spam. Post, image, and photos by the Hawthorne Hawkman. 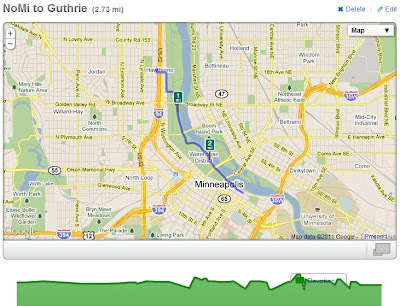 Over on the Deets, Ed Kohler often maps out his running routes, whether it's in NoMi or across the bridge. 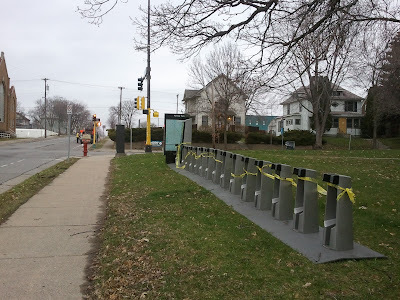 That practice, and the RunKeeper app on my smartphone got me thinking: how can we use these programs to get more people biking in NoMi? Since most people tend to want to get to wherever they're going in fifteen to thirty minutes, I thought I'd start a bit of a social experiment here on NXNS. 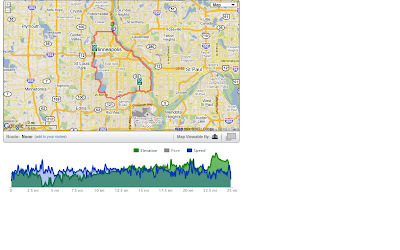 Where can you go, by bike, from various points in NoMi in fifteen minutes? 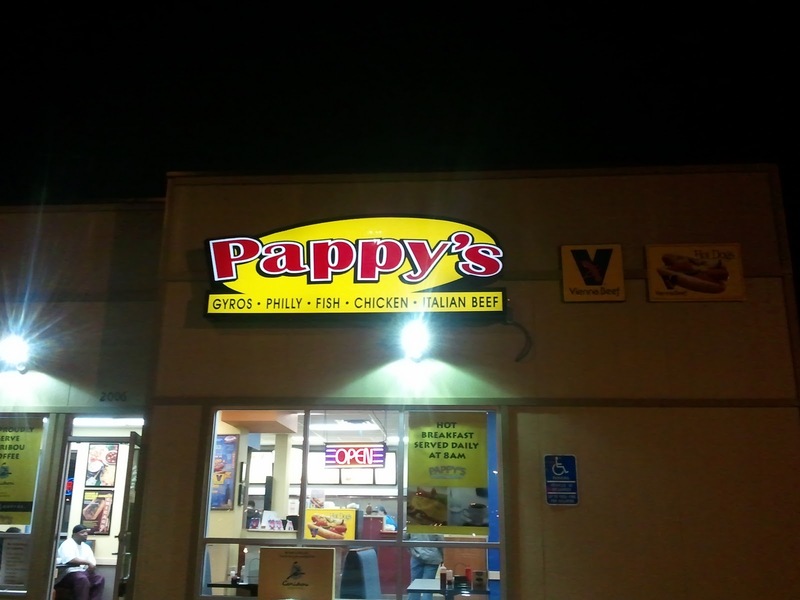 Last week, Pappy's opened up on Broadway, and I decided to check out Hawthorne's newest business over the weekend. Twice, just to be thorough. As I approached, the first thing I noticed was that at least they spelled "Italian beef" correctly. Unfortunately, they didn't run spell check or proofread their menu. 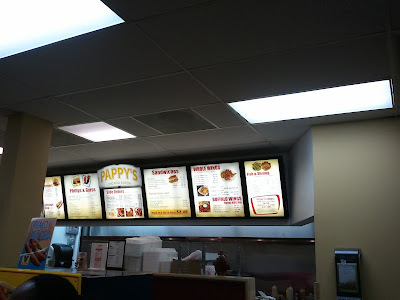 It's not exactly legible in the photo, but you can apparently get "Buffolo" chicken tenders, and your panini can be "tosted." 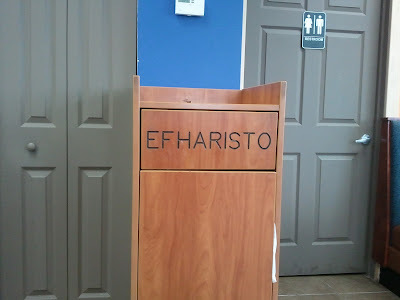 But when their trash bins say "Thank you" in Greek, maybe we should cut them some slack.